(CNN) - Education Secretary Betsy DeVos on Wednesday defended the proposal to allow certain teachers to be armed in schools, an idea pushed by President Donald Trump and some other Republicans. "I think to say 'arming teachers' is oversimplification and a mischaracterization really," DeVos said in a brief news conference after a visit to Marjory Stoneman Douglas High School in Parkland, Florida. "I think that the concept is to, for those schools and those communities that opt to do this ... to have people who are expert in being able to defend and having lots and lots of training to do so." DeVos went to the school to see teachers and students three weeks after a former student used an AR-15-style rifle to kill 17 people. During the visit, DeVos and principal Ty Thompson laid a wreath outside the fence of the building where the February 14 shooting occurred, and she met some students and teachers, according to the Department of Education. The trip was closed to the press, but DeVos was accompanied by a high school newspaper reporter, broadcasting student and yearbook photographer, the department said. The visit was designed to cause minimal disruption for students on their first full day back in the school, it said. "I was just there to be there, to be with them," DeVos said. At her press conference, DeVos did not take positions on other proposals that students have demanded, such as banning assault weapons. She said she had confidence in the Florida Legislature to address the issues. She praised the comfort dogs at the school, noting that several students' "faces lit up in an amazing way" when she asked about them. DeVos' visit drew criticism from some students and teachers at the school, including shooting survivor Carly Novell. "I thought she would at least give us her 'thoughts and prayers,' but she refused to even meet/speak with students. I don't understand the point of her being here," Novell wrote on Twitter. History teacher Greg Pittman said DeVos didn't visit any specific classes but met with a small group in the school's media center. "Is she here just for a photo-op? Is she bringing us any money for security? Is she bringing any money for mental health? Is she bringing us any money for teacher pay?" he asked. "Is she bringing us any other things that we need help with in education, or is it just a photo-op to send her down, appear in front of some cameras, take some pictures that she was here, pretend they care and then fly back off to Washington?" 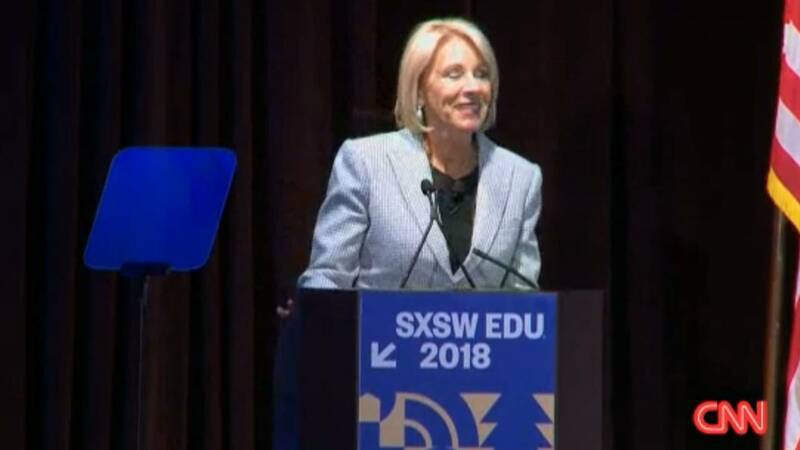 On Friday, DeVos announced that the Department of Education will award a $1 million grant to Broward County Public Schools as part of Project School Emergency Response to Violence, or Project SERV. "I have had the honor to meet several members of the Parkland community over the past days," DeVos said then. "The strength shown by these students, family members and educators is an inspiration to us all."